Caring for relatives can be a huge responsibility for a family, and many families choose to meet this responsibility by organising a rota of carers. In order for a rota to work well all of those involved in caring for a relative must be aware of the set schedule, have access to necessary information regarding their loved one and his or her health, be reachable by other family members and be aware of what will happen should there be any problems. 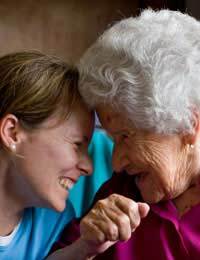 Working with a family rota when caring for a relative requires the cooperation of all involved, but should help everyone feel more connected and supported. A rota is a schedule or timetable which details who will do what and when. In the workplace a rota details which employees cover which tasks at which times, and this type of rota can work very well for families who are caring for a relative. A rota may be as simple as detailing who will stay with the relative on which days, or become as complicated as setting out which family members will carry out certain tasks or activities at certain times. In order for a rota of carers to work best, all carers must be consulted about what they are able to do and when they will be able to do it. It's no use making a rota if no one can actually carry out the tasks or times assigned. A rota is usually devised by one person after all of the others have given him or her their availability, but the person making the rota is not necessarily "in charge" of everyone else. Each family will need to work out which carer is best suited to creating the rota and how the other carers should let him or her know their own personal schedules. Once a rota is devised it's best if every carer receives a copy. This may be a daily, weekly or even monthly schedule and copies should be given out accordingly. In addition to the rota, each carer should also be able to access all information pertaining to the relative for whom they are caring. This might include medical records, information on medications and prescriptions, information on dietary requirements, emergency contact numbers, daily schedules, personal preferences, financial information and/or legal documents. Centralising all of this information, for example in one folder or file kept in the relative's home, means that carers do not need to keep track of their own copies but can access the information as needed. The rota is also a good place to list the names and contact information of each carer so that anyone can get in touch with anyone else should an emergency arise. Families should also determine a preferred method of communication for non emergencies, such as relating how the relative was feeling on a certain day, giving details of an activity (s)he enjoyed or updating everyone following a routine medical appointment. Some families use a notebook to act as a kind of journal for the carers, while others go more hi-tech with a private blog or list-serv that all carers can access. Whatever a family decides, all carers should be aware of this method of communication so that all information is passed in this way and nothing slips between the cracks. Even the most organised family with the best laid out rota will run into problems. This is inevitable when multiple carers are involved in looking after a relative. While the problems themselves may be anticipated, families should endeavour to come up with emergency plans from the start. What happens if someone can not make it to their assigned day or task, what happens if there is a medical emergency and what happens if someone can not access a critical piece of information are all situations for which a "Plan B" will come in handy. Sorting out this plan, and maybe even a third if need be, is important for all carers to stay on the same page should something unexpected pop up. Family rotas are a great way for multiple carers to support a loved one. Organising a schedule, centralising all information, determining a preferred method of communication and anticipating problems will all help families prepare to care for a relative using a rota system.